Two years ago the Jennings family opened Three Mugs Brewing Company in the underserved craft beer area of Hillsboro, Oregon. Though Hillsboro is Oregon’s fifth largest city, it is home to only three other breweries, Vertigo Brewing, McMenamins Cornelius Pass Roadhouse, and Ambacht Brewing. To mark its second year in business Three Mugs Brewing will host its 2nd Anniversary on Friday, August 14 beginning at 2:30pm. For this special day Three Mugs Brewing will be serving up four special, small-batch beers just for this event, along with 10 of its regular lineup of beers in addition to ten guest taps, including four craft ciders. There will also be live music and entertainment and a food truck out front. Entertainment kicks off at 3 pm with recorded music from Ultimate Entertainment DJs. Three Mugs was lucky to get Lace & Lead as the musical headliner for its anniversary at 7:00pm. Lace & Lead is a Nashville based duo comprised of Emi Tanke and Trysh Hill with local roots dating back to their humble beginnings in Portland back in 2012. 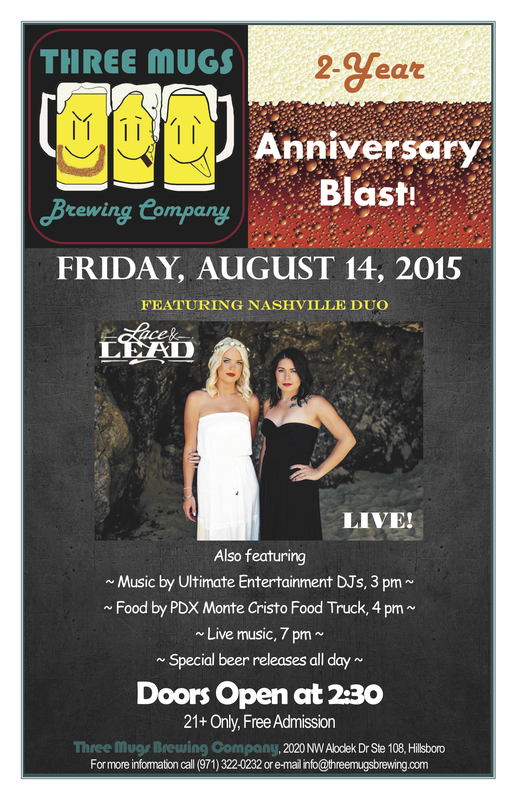 Additionally, a delicious fare will be available from PDX Monte Cristo food truck starting at 4:00pm. This is a 21 and older event and best of all there is no cover charge. Make sure to offer congratulations and share a beer with Jay, Christopher, Wendy, Joshua, and Cassie Jennings on Friday, August 14!